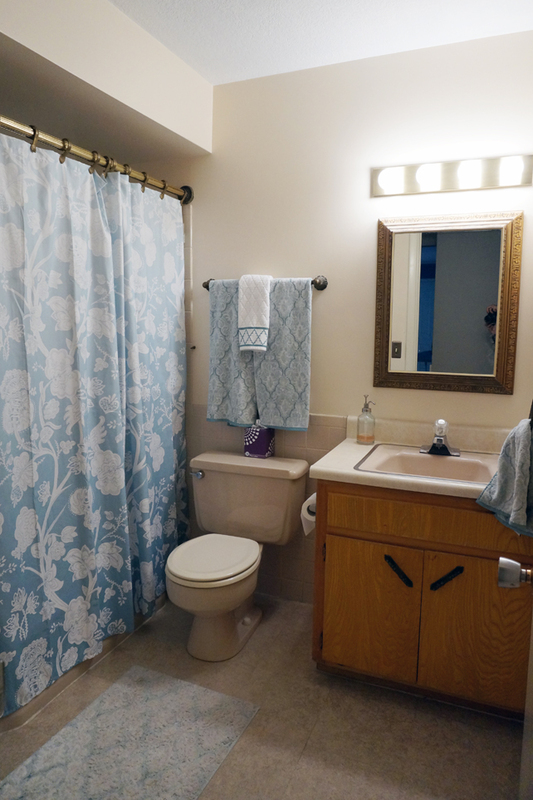 We’ve decided that it’s time to give our guest bathroom a mini-makeover. It’s definitely my least favorite room on the main floor of our house and frankly a little embarrassing. It’s in semi-original condition, which unfortunately does not mean “charming” or “vintage” but mostly just ugly and somewhat dysfunctional. It took a long time to actually commit to doing anything with this room, even painting it. It needs so much work that I figured there was no sense in doing anything if I wasn’t going to do it right. The floor is a pretty gross vinyl that was probably peach at some point in time. The vanity cabinet has definitely seen better days, but I can work with it. The sink is grimy, and the faucet leaks. The medicine cabinets and accessories are really not my style – nor do they work with the architectural style or period of the house. Pinky beige tile covers part of two walls and continues up into the shower. The trim work is pretty banged up, and one wall is covered in the weird paneling that one of the previous homeowners obviously loved because it is everywhere. 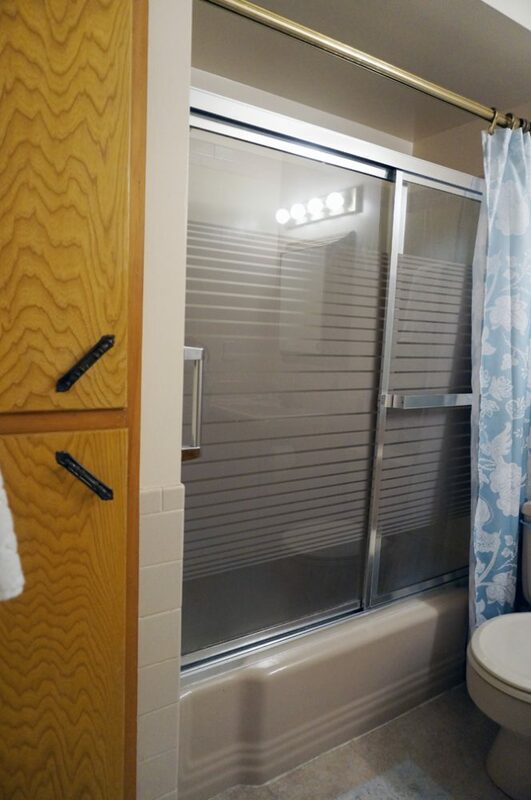 We requested a quote to replace the almond colored tub and shower surround that was “updated” sometime in the 80s, and I thought the number was pretty shocking – north of $5000, and that didn’t even include glass doors or a new faucet. At this point, I just resigned myself to living with the bathroom as-is. Then I saw Jenny’s bathroom update, and I was suddenly inspired to make some changes. She painted out her wall tile and totally transformed the space with paint, lighting and new accessories. I also thought this bathroom makeover from Go Haus Go was pretty awesome. Paint out the wall tile. Paint all walls and trim. Add a decorative paint treatment to the walls. Replace the base trim and door casing. Paint the vanity cabinet and the doors to the linen cabinet. New vanity top and faucet. All new accessories (towel bar, hooks, tissue holder, etc). My budget for the project is between $1500 and $2000. I think I can completely change the look and feel of this space without over improving it. And, if we do decide to do a full remodel at some point, we’ll be able to reuse many of the items. In the meantime, I’ll no longer be embarrassed when we have guests over.